What’s for dessert this Thanksgiving? Pie, of course—why even bother to ask? And pumpkin will be the pie of choice for most households throughout the US. But how about an alternative that’s even tastier? That would be Sweet Potato Pie, a favorite in the American South. Sweet potatoes have deeper, richer flavor than pumpkin. And our gluten-free walnut crust is both tastier and easier to make than the traditional pastry shell. So welcome to the best Thanksgiving dessert. Ever. Pumpkins and sweet potatoes hail from two different botanical families (Cucurbitaceae for pumpkin, Convolvulaceae—morning glory—for sweet potatoes). But when made into pie, they have remarkably similar flavor profiles. Indeed, they’re often spiced almost identically. Sweet Potato Pie has loads more oomph, though. There are two types of sweet potatoes commonly found in the US. One has reddish brown skin and deep orange flesh, while the other has golden-toned skin and yellowish flesh. The first kind (which tend to be sweeter) are sometimes called “yams”—though this is a misnomer. Real yams are an entirely different veggie; they’re not even related to sweet potatoes (and they’re not easy to find in US markets). Any sweet potato you’re likely to see in your local market should work in this recipe—which is quite straightforward, BTW. There are 3 major steps, none of them difficult. First, you need to make the crust and blind bake it (that is, bake it without a filling). Second, you need to cook the sweet potatoes and purée them. (We boil the sweet potatoes, but you could use another cooking method if you prefer; more on this in the Notes). Third, you need to mix the pie filling and bake the pie. Mrs. Kitchen Riffs is the baker in our household, and this recipe is hers. The crust is the same one we used in our recipe for Lemon Cheesecake with Walnut Crust. If you prefer, you can substitute a pastry crust (your own or store bought). If you use a pastry crust, you can blind bake it or not—your choice. The filling for this pie was adapted from a recipe in James Beard’s American Cookery. Prep time for making the crust is about 10 minutes, and baking time is 15 to 20 minutes. Prep time for cooking the sweet potatoes is 5 minutes, with cooking time of about half an hour. Prep time for making the pie filling is 10 or 15 minutes, with final baking time of 40 minutes or so. Preheat oven to 350 degrees F. Butter a 9-inch Pyrex pie plate (if using a metal dish, preheat oven to 375 degrees F). In a food processor, grind the walnuts with the granulated sugar until fine. Meanwhile, melt the butter in the microwave (preferably in a container with a lid; about 1 minute.) Add the butter to the walnut mixture and pulse until well mixed (it will look like wet sand). Press the walnut mixture evenly around the bottom and sides of the pie plate. Bake for about 15 minutes, or until the crust is starting to brown around the edges. (While the crust is baking, you can start cooking the sweet potatoes for the filling; see below). Remove the crust from the oven and allow it to cool while preparing the sweet potato filling. Scrub the sweet potatoes and cut off their tips, but don’t peel them. Place the sweet potatoes in a cooking pot, cover with water, and add 2 teaspoons Kosher salt to season. Bring the water to a boil on the stovetop. Once the water is boiling, reduce to a simmer and cook until a paring knife or fork can be inserted easily into the center of each sweet potato. Depending on the size of the sweet potatoes, this can take about 20 to 30 minutes. When the sweet potatoes are done, drain them and place them on paper towels to cool. (See Notes for alternate methods of cooking sweet potatoes). Once the sweet potatoes are cool enough to handle, preheat the oven to 350 degrees F (if you turned it off after baking the crust; preheat to 375 degrees F if using a metal baking dish). Peel the sweet potatoes and cut them into chunks. Purée them with a food ricer or a food mill. Alternatively, place the cooked sweet potatoes in a medium-sized bowl and mash them with a potato masher or a heavy spoon. It’s OK if a few chunks remain. Using a stand mixer (or in a large bowl, using a hand mixer), beat the puréed sweet potatoes until smooth. Add the brown sugar and beat well. Then add the eggs and mix until well incorporated. Add the whipping cream and beat until combined. Add the cinnamon, ginger, and ¼ teaspoon Kosher salt. Add the cloves and nutmeg, if using. Mix until well combined. Taste and adjust spices if necessary. Pour the sweet potato mixture into the cooled walnut crust, smoothing the top. Bake for approximately 40 minutes. At the 40-minute mark, test the pie with an instant-read thermometer. If the pie filling has reached a temperature of about 170 degrees F, it’s done (see Notes). If the pie filling is not yet close to this temperature, keep baking—but check every five minutes or so to make sure you don’t overbake. Once the pie is done, remove it from the oven and place it on a wire rack to cool. After it has cooled for an hour or so, wrap it in plastic shrink wrap and place it in the refrigerator for at least 4 hours (up to 24 hours) to chill and set completely (see Notes). Serve the pie by itself, or garnish with ice cream or whipped cream (we particularly like to use rum-flavored whipped cream; see Notes). Most recipes for sweet potato pie use pastry shell crusts. We prefer a ground-walnut crust—which is tastier, as well as gluten free. Clear Pyrex (glass) pie plates tend to hold heat more efficiently than metal ones, so it’s a good idea to keep the oven temperature about 25 degrees cooler when baking a pie in clear glass. Why use a lidded container when melting the butter? Because butter can explode in the microwave, creating a mess if not contained. So not fun. We like to use Kosher salt in most recipes. But if you don’t have that on hand, you can use plain table salt (though I’d reduce the amount by about half since table salt is finer and more “condensed” than Kosher). Would you prefer to use a different method for cooking the sweet potatoes? The most flavorful way is probably to roast them. You can use our recipe for Roast Sweet Potatoes, but leave out the seasonings—and coat the sweet potatoes with melted butter instead of olive oil. Alternatively, you can microwave the sweet potatoes. Just peel them, cut them into chunks, and microwave them in a microwave-safe covered dish until they’re soft. Or you can peel the raw sweet potatoes, chunk them, and boil them. You can even bake the sweet potatoes, then scoop out the pulp when they’re done. Feel free to reduce or increase the amount of brown sugar used in the filling (we don't like our dessert pies to be extremely sweet, but you may prefer otherwise). Eggs carry a slight (but real) risk of salmonella. So we suggest using pasteurized eggs when making any type of filling that you might taste raw. Although it’s unlikely the eggs you buy will be infected, why take the risk? Especially since you’ll want to taste this pie filling to test the spice level. You can identify pasteurized eggs because they usually have a red “P” stamped on them. We like to use full-fat whipping cream in this pie filling. So it’s not a diet dessert! If the fat content is a concern, you can substitute milk for some or all of the cream (though the flavor won’t be as rich). The quantity and combination of spices can be varied to taste in this recipe—so don’t be afraid to experiment. You might find that you like more or less of a particular spice. We’ve listed cloves and nutmeg as optional because some cooks find their flavor overwhelming. We think they add a nice touch—and sweet potatoes really are robust enough to stand up to them. But your call. His original recipe also noted that some cooks like to add grated orange rind to the filling. Again, not something we usually opt for, but you might want to. The filling for this pie will be fully cooked at a temperature of 160 to 180 degrees F. The pie will seem loose and jiggly when you take it out of the oven, but that’s OK. It will set up as it cools (especially in the fridge). Do not overbake this pie—it will crack and dry out quickly if you do. An instant-read thermometer is perfect for checking the internal temperature of almost anything you bake or cook. Most of the ones you can buy are accurate, although some may take 10 or 15 seconds to record temperatures. Our favorite instant-read thermometer is the Thermapen. These are accurate to less than 1 degree F, and take a reading in 3 seconds or less. The downside? They’re pricey (about $90 or so). But they’re worth it. If you don’t have an instant-read thermometer, you can eyeball the pie filling for doneness. It should look “set” around the edges, but the middle two or three inches should still be jiggly. This pie is wonderful all by itself, but a topping of ice cream or whipped cream is delicious. Want to make rum-flavored whipped cream? Here’s our technique: Pour 2 cups of heavy whipping cream into the bowl of a stand mixer (or into a large mixing bowl, if using a hand mixer). Add about three tablespoons of powdered sugar and 1 tablespoon of dark rum. Begin to whip on low speed. Increase to medium as soon as you can (i.e., when the cream is becoming thick enough that droplets don’t spatter from the mixing action). Beat the cream until it forms soft peaks, then taste and add more sugar and/or rum if necessary. Continue beating until you reach the medium or stiff peak stage (whichever you prefer). Refrigerate the whipped cream if it’s going to be sitting for more than a few minutes before you serve it (don’t worry, it won’t collapse). “Yup, when we stopped in De Valls Bluff, Arkansas to try the great barbecue place that Jane and Michael Stern of Roadfood fame wrote about,” said Mrs K R.
“And as it happens, we can walk to a pretty good barbecue place in our current neighborhood,” I added. Great idea. Sometimes the best roadfood is right at home. Thanks for sharing your Sweet Potato Pie recipe. Being from the deep south (what could be more so than Savannah, Ga.) the sweet potato has always been our go-to favorite. I am always looking for a new variation. I am pinning. I will let you know how we like it. Hi Ginger, welcome! I hope you like this! 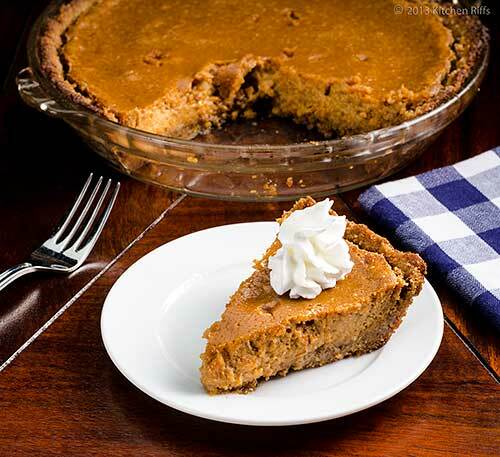 It has tons of flavor, with a profile that's a little towards the the typical pumpkin pie type flavoring. Thanks for the comment. John, you just took me on a trip down memory lane. My grandmother always had sweet potato pie on our holiday table. It's definitely one of my favorites and I prefer it over pumpkin pie. Love the crust idea too! Thanks for sharing a great recipe! Hi Bill, this crust is dynamite! And the pie is darn good too - really better than most pumpkin (OK, all pumpkin) versions I've had. And I speak as someone who really loves pumpkin pie! Thanks for the comment. Love this combination of sweet potatoes with a walnut crust, wow! Think I already like it better than a traditional pie, kudos to your pastry chef!! I have never been a pumpkin pie person, but sweet potato pie? Now, that's a pie I can get behind! And your version sounds scrumptious ... the walnut crust puts it over the top! John, I love the way you give such clear concise instructions with your recipes… it's great. I have a friend who moved to DC on a posting, I know he would love this. Sharing it now. Hi Asmita, isn't this nice? ;-) Thanks for the comment. Hi Chris, the crust is wonderful! Goes so nicely with the pie, too. Thanks for the comment. Hi Kimberly, that crust really is super delish - worth trying. Thanks for the comment. Hi Lizzy, gosh, thanks for those very kind words, and for taking time to comment. Wow, what a beautiful pie for the holidays, John! I love the warm, spicy fall flavors you used, and that walnut crust is truly creative and enticing! John, the crust sounds wonderful, I think it would go so well in many other pies too! 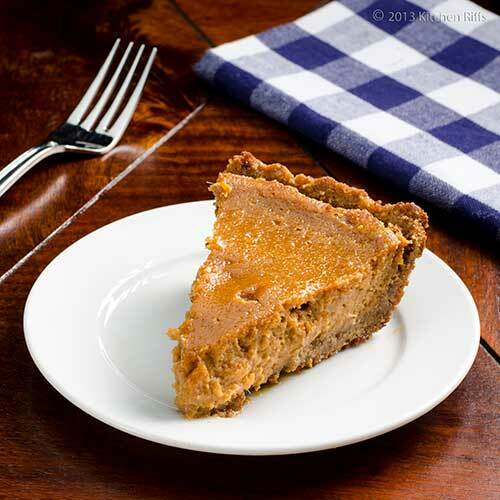 LOVE sweet potato pie (or even a mix of sweet potato and pumpkin) so much more than just pumpkin alone; much better flavor and such a velvety texture, it makes you wonder why pumpkin seems to win the popularity contest. and i really like the walnut crust addition: that's a lovely pairing. I have wanted to make this pie for years but because every year we have my husbands sweet potato casserole, I don't. I don't really like pumpkin pie too much because like you said, I think sweet potatoes have a much deeper flavour. One day I'm going to make it!! Thanks for the recipe John, now I won't have to go looking for one. I know of a great one right here. Actually, thank Mrs KR for me. Hi Georgia, isn't this great? It's really a keeper. Thanks for the comment. Hi Gintare, we use that crust a lot! It's also terrific in many fruit pies (apple and peach in particular). Thanks for the comment. Hey John, I love the idea of a pie and bbq road trip.I know you have a book in you and I think that should be it! What fun that would be! And what fun this pie is. We do get stuck in traditions and this is a good one to do. I was never a great fan of pumpkin so this would be a very worthy choice. My thanks to Mrs. KR. Also never thought of taking the temperature of the pie. Great idea! Hi Shannon, I truly do love pumpkin pie, but I have to say sweet potato pie beats it hands down. We've got another version of sweet potato pie that some like better than this one that we'll probably post at some point. But this one's my fave! Thanks for the comment. Hi Nazneen, a lot of pumpkin seems to have a rather thin, uninteresting flavor. Sweet potatoes are just bursting with flavor! I love them. Thanks for the comment. Hi Abbe, a pie like this is essentially a custard, so taking the temperature is the easiest way to tell when it's done! We do like the idea of a pie and barbecue tour - may well do it some day. ;-) Thanks for the comment. I know it sounds weird but I have never been a pumpkin pie fan, despite the fact that I love everything else made with pumpkin. So, this sweet potato pie would definitely entice me a whole lot more. It looks like the perfect holiday dessert. I ADORE sweet potato pie! I don't make it nearly enough because my family always wants pumpkin and pecan for Thanksgiving and I always feel like sweet potato and pumpkin are so similar in texture. But, I'm going to need to make one this fall - it's been too long! And the walnut crust?! Genius! Hi Denise, it's a great pie - you'll enjoy! Thanks for the comment. Hi Carolyn, this really does have more flavor than the pumpkin. And the crust is way better than a pastry one for sweet potatoes! Thanks for the comment. Hi Amy, that walnut crust really is worth making. And the pie too, of course. ;-) Thanks for the comment. Oooh walnut crust?! That sounds incredible! Wow, this sounds amazing! Now if I could somehow get my family out of their Thanksgiving rut, I'd love to give this recipe a try! Hi Nee, I think this crust goes well with peach pie. And sweet potato, of course! Thanks for the comment. Hi Bam, we aren't giving up pumpkin pie either, but it's in second place after this pie. It's so good! Thanks for the comment. Hi Greg, it really is great to have a baker in the house! And a meal like Thanksgiving is such a production that the more hands the better. Thanks for the comment. Hi Kristi, it is, it is! Really worth making. ;-) Thanks for the comment. Hi Liz, maybe make two pies? And have a taste off! Thanks for the comment. Hi Amy, this really is delish. I do like pumpkin pie, but this one is definitely better! Thanks for the comment. You are killing me with your last couple of posts - I want them all!!! I love pumpkin pie but sweet potato pie is my fav! This one looks great - especially with that GF crust! Hi Alyssa, sorry about that killing thing. ;-) Isn't sweet potato pie sooo goo? And that crust is beyond belief. Thanks for the comment. Hi Anne, sweet potato pie is really nice stuff. IMO, something I think you'd really enjoy making - the flavor is quite good, and if you like pumpkin pie you'll like this. Wouldn't it be fun to go on a BBQ and pie road trip? ;-) Thanks for the comment. OMG, that pie looks and sounds terrific! A wonderful Thanksgiving treat. Without a doubt I am baking Sweet Potato Pie for Thanksgiving. Pumpkin Pie just seems so "October" this year:) And Mrs. K.R. has included whipped cream in the mixture! Oh yum! Hi Charlie, we started making this crust because of its terrific flavor. That it's GF is a bonus! Thanks for the comment. Hi Kiran, I've already had a few slices for you! But I'll have a few more. ;-) Thanks for the comment. Hi Rosa, it's really nice! Totally delish. Thanks for the comment. Hi Louise, this is really a terrific pie. That rum-flavored whipped cream is terrific! Thanks for the comment. I'm about to faint with y our delicious sweet potato pie, or more like I am about to eat my computer!!! Looks so good! I love pumpkin and sweet potato, and I might consider this as main dish. :D If I was your neighbor, I would be right over. I love this pie that much! Hi Candy, this really is totally delish. ;-) Thanks for the comment. Hi Gayathri, this pie really has superb flavor. And it does look nice, doesn't it? Thanks for the comment. Hi Nami, I've tried to eat my computer screen before - doesn't work! :D This actually is good enough to be a main dish. You'll like this, I promise. Thanks for the comment. I am so curious about a pumpkin pie. I've never tried it. I saw few recipes online recently and I think it's high time to try it out. Hi Marta, you definitely should give pumpkin pie a try sometime - great flavor. But you'll want to try this one too - its flavor is even better! Thanks for the comment. Hi MJ, we're the same way, and I can't figure it out - sweet potato pie is superior. Maybe because it's easier to open a can of pumpkin puree? ;-) Thanks for the comment. This looks so incredible.. i'm a fan of sweet potato pie, never made it though. Maybe I'll bake it this year and use your recipe... my family is more into cakes. For the crust, do you think pecans would work instead of walnuts? I don't know, just feel pecans are more seasonal for thanksgiving. Thanks! I have yet to make a sweet potato pie; thanks for reminding me that time is running out!! This looks wonderful. The crust sounds fantastic! Love that it's naturally gf. I have been thinking about making sweet potato pie forever. This is the shove I need to do it. I love pumpkin sweets but pumpkin itself doesn't have a great flavor - it's all the spices that make it yummy. Sweet potatoes on the other hand are so delightful. I love a baked one for dinner with nothing on it. Hi Honey, we haven't tried using pecans instead of walnuts for the crust, but they should work. Should be pretty good! Let us know if you try it. Thanks for the comment,. Hi Dan, always happy to nudge your memory! Thanks for the comment. Hi Uru, I was indeed subscribed, so I'll check into that. And this pie is wonderful - worth trying. Thanks for the comment. Hi Laura, it's a great crust - tons of flavor. My favorite kind! We like simple baked sweet potatoes too. Thanks for the comment. I've enjoyed catching up on all your delicious dishes that you have been creating while I've been traveling in Europe. For a girl that grew up in the south, I can't believe that I have never had sweet potato pie. Love the sound of it with the crunchy walnut crust. Our family likes sweet potato more than pumpkin so why haven't I been making this? Love the sound of walnut crust. Hi Karen, your trip sounds like so much fun! You definitely need to try sweet potatoes in pie sometime - they're wonderful! Thanks for the comment. Hi John, you can't go wrong baking a pie for Thanksgiving! And sweet potato pie is dangerously good. Dangerously because it's all to easy to have a second serving, then a third, then . . . ;-) Thanks for the comment. Hi Madonna, we ask ourselves the same question! But I think it's going to be sweet potato pie here on out for Thanksgiving. Thanks for the comment. This crust is a wonderful idea and sounds very tempting. Love sweet potatoes in desserts they are so rich and have a great flavor. I absolutely love the idea of sweet potato pie. But would my family forgive me if I substituted it for pumpkin? I've bookmarked it: let's see if I have the nerve to make the switch! It wouldn't be Thanksgiving without pie. and leftovers. I know you need firstovers to get to leftovers but really, it's all about the leftovers for me. I love sweet potato pie and can't wait to make your recipe. Hi Kumar, it's really a super recipe - so much flavor! Thanks for the comment. Hi Daniela, the crust is superb. As is the filling. ;-) It really is a nice dessert for a festive event! Thanks for the comment. Hi Beth, do a taste off! More pie is always good, right? ;-) Thanks for the comment. Hi Atka, it took us forever to start using it for pie filling, too. But it's hard to go back to pumpkin once you've tried sweet potato! Thanks for the comment. Hi Maureen, I like the term, "firstovers!" And I agree the leftovers are the best part. Thanks for the comment. Gorgeous pie for the holidays, John! Never tried sweet potatoes in a pie (yet), but now I am itching to! :) And, walnuts are always welcome in my desserts! Hi Julila, isn't this nice? 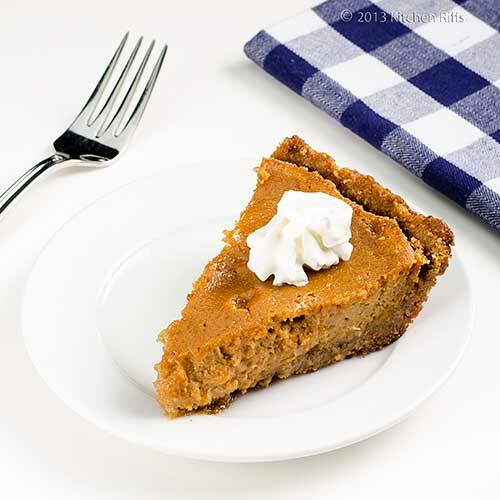 Sweet potato makes a wonderful pie - we love it! And the walnut crust is amazing. Thanks for the comment. Hmm, so that's why my butter keeps exploding in the microwave (but this was not as bad as chestnuts exploding in the oven- that sounded like World War III)! I've always used condensed milk in my pumpkin/squash pies. That must be a throwback from the 50's and 60's. Might be time for me to try real cream next time! Seriously, I believe that pumpkin or sweet potato pie is so good, I could literally eat the entire pie in one sitting! This is terrific! I can't wait to make this for my daughter who eats gluten free. I love the change from pumpkin too! Hi Fran, chestnuts can be kind of a pain, can't they? Great flavor, though. I do think that condensed milk is from the 50s - Mrs K R and I were talking about that as we (mainly she) developed this recipe. You do see so many recipes that call for it, but cream is so much better. Thanks for the comment. Hi Kristi, we're fine with gluten, but it just worked out this entire recipe is GF. And we're happy it turned out that way - we had a spur-of-the-moment dinner with some friends who are gluten-sensitive, so this pie worked well. And this is such a nice change - I think you'll like it. ;-) Thanks for the comment. I'm also a sucker for a sweet potato ( > pumpkin, yes!) pie. And your notes--oh gosh, I love how thorough they are, as always. Lovely recipe and post! Hi Julie, just do the recipe and you'll have an original. ;-) Thanks for the comment. Hi Ala, always a pleasure when you ca take time from your studies to drop by! And yes, at least when it comes to pie, IMO sweet potato > pumpkin. By a lot. ;-) Thanks for the comment. I have never eaten sweet potato pie before, but it is on my list to try. This pie looks amazing! Thanks for sharing. Hi Dawn, this is a good recipe - definitely something worth trying. Hope you enjoy! Thanks for the comment. Hi John, I would love to have a big slice please. :)) I don't fancy pumpkin.. but sweet potato anytime any day. 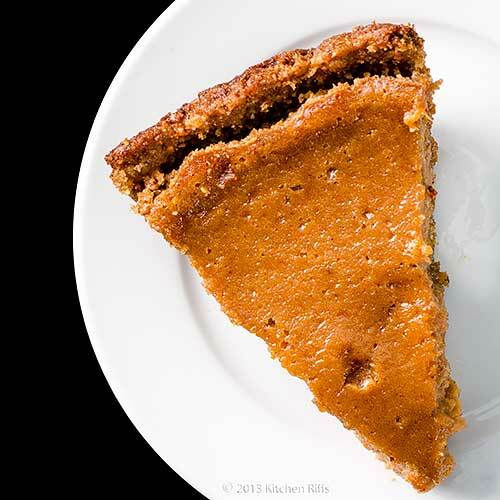 Your sweet potato pie look very delightful. Nice click! Hi Amelia, I do like pumpkin, but sweet potato makes a better pie, IMO. This version is really worth making. Thanks for the comment. That my friend looks so decadent. That is one damn good recipe. Hi Raymund, this really is most excellent. Really worth making. Thanks for the comment. I am just started to experiment with sweet potato desserts. My family loves pumpkin pie, so they should love a sweet potato pie. And with walnuts? Sounds amazing! Hi Laura, this really is a terrific dessert. Loads of flavor, and something that many people haven't had. Worth trying. Thanks for the comment. I have never had sweet potato pie before and I'm intrigued! Thanks for this recipe John, will have to give this one a try. Hi Anne, if you like pumpkin you definitely need to try this. It's quite similar, but better. IMO, of course. Thanks for the comment. What a great twist on the traditional pumpkin pie! And with a gluten-free base, its a total winner. Thanks for the recipe John. Hi Amanda, this is much better than pumpkin pie IMO - and I'm a pumpkin pie lover! Thanks for the comment. John, I couldn't agree more! Sweet potato pie is the best. I love your walnut crust, too, and can't wait to try it. What a marvelous dessert for the holidays or anytime! Thanks for sharing. I hope you're enjoying a festive holiday season! Hi Hannah, the walnut crust is a real winner. As is the pie, of course. ;-) Thanks for the comment.